Nuremberg Film Festival: Best Film; Berlin International Film Festival, Chicago International Film Festival, Sydney Film Festival Nominations: Best Film. Six other nominations. 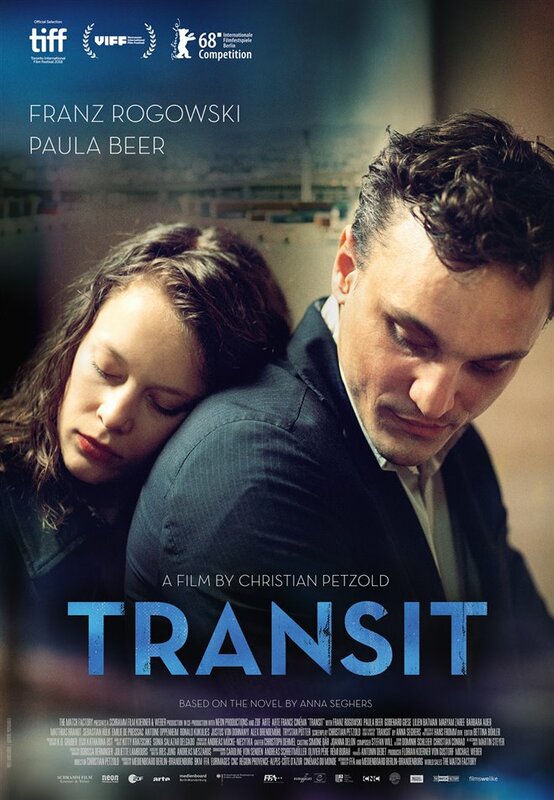 “Transit,” director Christian Petzold’s moody meditation on exile and rootlessness, is unsettling and powerful. The director takes the Casablanca-like story from a wartime novel by the German writer Anna Seghers and places it in a more-or-less current setting using contemporary dress. German-born presumably Jewish refugee Georg (Franz Rogowski, a Joaquin Phoenix lookalike) escapes occupied Paris and flees to Marseilles ahead of advancing troops. There he adopts a dead man’s identity in a daring scheme to get the necessary transit passes for a ship to Mexico. While he waits, he meets other desperate refugees including the mysterious Marie (Paula Beer), separated from the husband who would help her escape. The film’s tension is provided by whether Georg will get to use the documents. He is also torn over Marie with whom he begins an affair, only to learn she is the dead writer’s wife. Georg also gets distracted by other distressed souls, including a small boy and his deaf mother, and a lonely architect. There are references to “camps” and “cleansing.” Everyone spends a lot of time in queues, waiting in offices, fearful and fretting. The spectre of fascism looms as sirens scream and illegals are rounded up. The film makes the link between wartime fascism and current anti-refugee sentiment quietly explicit and highly effective. Petzold makes palpable the refugees’ plight, their fear, shame, despair, and sense of homelessness.